This article describes what to do about interior wall and ceiling thermal tracking stains, thermal bridging stains, building air leaks, and building insulation defects. We give detailed step by step suggestions for removing and preventing indoor stains caused by thermal tracking. We include diagnostic procedures to figure out why these stains appear, suggestions for cleaning or painting over indoor stains, and how to prevent their recurrence. I have what seems exactly how you describe thermal tracking on my ceiling in the living room and some discoloration in other rooms. I live in a twin ranch home in Philadelphia that is quite small/cozy for a family of 8. My question is what do I do to stop this discoloration from continuing? I had someone go into the attic and he said that he never saw black soot in an attic like he saw in mine - it was congregated along the beams of the ceiling. How do I get rid of it? My furnace was replaced less that 10 years ago by a fellow who has a reputation for his meticulous work - the furnace is also well maintained. We are considering moving and I would like to repaint my house soon. Any suggestions? - P.C. Below we provider a quick summary of some thermal tracking stain clean up and prevention suggestions, followed by an in-depth article on this topic. Wash stained surfaces: if your building walls and ceilings have paint in good condition it is usually possible to wash the surfaces, though you may need to make more than one pass to remove streaking, and ultimately you may simply decide to re-paint. Use a non-suds ing detergent intended for cleaning interior walls and ceilings. If cleaning is not sufficient you'll need to re-paint. For thermal tracking stains on building insulation in an attic, no cleaning is necessary, just find and fix the air bypass leaks or missing insulation. As long as the insulation has not been wet (and at risk of mold contamination) surface staining from dust deposition by air movement across the insulation won't impact its effectiveness. But fixing the air leaks that left the dust there will indeed improve building insulation and energy efficiency, often significantly. Watch out: if you try simply painting over dark thermal tracking stains the black stains may bleed through your new paint job. If necessary use a lacquer primer/sealer paint before your top coat. But before re-painting or even cleaning, some diagnosis of the cause of thermal tracking stains is important since if you don't correct the cause of this staining your newly cleaned walls or paint job may be at risk. Identify the cause of thermal tracking: review the other sections of this article. Visual inspection of attics, wall cavities, or other building areas can tell you if the building is un insulated or has openings where air is bypassing insulation. Be alert also for building cavities where insulation has become wet and possibly moldy as such would need to be removed before continuing to improve the insulation and air tightness of the home. And don't forget to be sure the stains you are examining are due to thermal tracking. See OTHER STAINS ON INDOOR WALLS & CEILINGS. Add insulation to un insulated building cavities such as un insulated attics (first priority) or walls (second priority) and pay attention to areas of air bypass leaks where insulation has been omitted, removed, or imperfectly installed. Identify areas in the building where there are air bypass leaks and seal them. 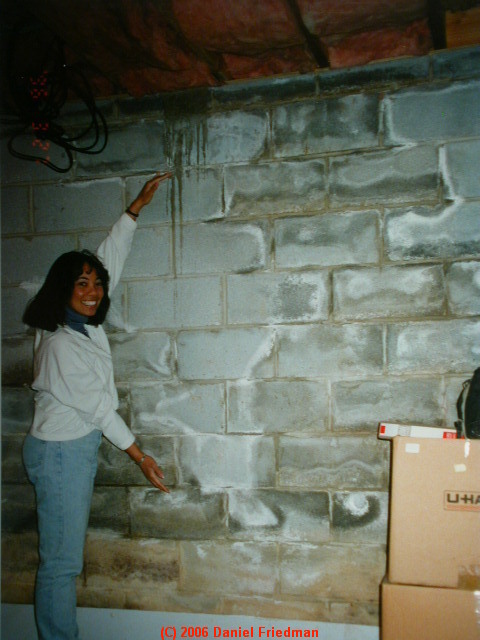 AIR BYPASS LEAKS MARKS ON INSULATION shows how to recognize where air is moving past poorly installed building insulation. Seal significant building air leaks against unwanted air movement such as openings at exterior trim, window perimeters, or at the floor/wall or ceiling wall juncture. Review the building indoor moisture levels: since even a reasonably well insulated building may develop thermal tracking marks if interior humidity is excessive. If the building has unwanted wet conditions such as a wet crawl space or basement or other areas of leaks, those conditions need to be corrected. Review and reduce sources of indoor soot or debris such as an oil or gas fired heating system that is not working properly, since those conditions need to be corrected for safety and economy of building heating as well. Since excessive use of most types of candles can also produce unwanted levels of indoor soot, if those are a principal source of indoor stains their use should be reduced or eliminated. Is the oil or gas fired heating system operating properly? If not it may be not only smoky or sooty, but also operating inefficiently and worse, it could be dangerous. A sooty gas boiler or furnace is very dangerous and should be shut down and serviced immediately. See HEATING SYSTEMS for articles on heating system inspection, diagnosis, and repair. Are there or have there been occupants who were smokers of cigarettes, cigars, pipes? Are there fireplaces or woodstoves that release smoke to the interior? Have people used candles, especially scented candles in the building? Are building occupants smokers? Cigarette smoke is a big contributor to thermal tracking stains, often leaving heavy brown stains on building walls even where other stain sources are absent. Most samples of thermal tracking particulate deposits that we examine in our forensic lab are simple house dust: a mixture of fabric fibers and skin cells. These are normal debris found indoors. But more frequent indoor cleaning, HEPA vacuuming, eliminating of or reducing the number of carpets, installation of glass fireplace doors, avoiding burning food on the stove, are additional examples of steps that can reduce the indoor airborne particulate level and thus the rate of staining on indoor surfaces. Use a better grade washable paint when re-painting stained surfaces. That will make future surface cleaning easier. If your building diagnosis is not accurate there is a real risk of both wasting money and possibly failing to attend unsafe conditions such as mold contamination or unsafe heating appliance operation and dangerous carbon monoxide hazards. So it is important to determine why the stains are occurring, to rule out or address safety issues, and then we can proceed to a simple three step procedure. at WHAT TO DO ABOUT THERMAL TRACKING and continuing in detail below. To be reliable a thorough building investigation to identify the causes and recommend cures for indoor stains and thermal tracking will examine the entire property, outside and inside, examining all readily accessible areas, examining the mechanical systems, (plumbing, heating, air conditioning), the building ventilation and insulation, and more. Focus of the inspection may be on the sources of soot and debris, moisture, as particle deposition sources, as well as on building conditions that cause particle deposition on surfaces: high indoor moisture, air movement, insulation and ventilation defects. Warning about harmful mold: if you hire a professional to address building staining and its cause and remedy this is not a contract not to address a mold or air quality investigation which is a more extensive (and more costly) procedure. For this reason significant mold contamination, health and safety risks, and significant mold remediation costs are likely to be faced at this property: these are conditions which were excluded from the scope of a site investigation for stains, thermal tracking, sooting, or heating and air conditioning problems. Mold investigation: Where a building investigation shows that the property has had a history of leaks or moisture problems, and in some other cases, we recommend that you have a proper mold investigation performed as it is likely that the property faces significant mold cleanup cost. MOLD EXPERT, WHEN TO HIRE -provides assistance in deciding when it is justified to hire a professional to inspect for mold and to prepare a mold remediation plan. ACTION GUIDE - WHAT TO DO ABOUT INDOOR MOLD contains general advice about removing mold contamination in buildings. Warning about cleanup effectiveness: No cleaning measures will be effective, and the cost of performing them may be wasted, without also addressing causes of building contamination such as water entry, sewage backups, building leaks, and building ventilation defects. Those defects which a professional inspection was able to identify are addressed at Exterior, Interior, and Mechanical System recommendations below and in the report specific to your building. Others may be discovered. Cleanup and demolition can begin, but cannot be completed reliably until/unless the building is acceptably dry. If not all suspect areas are addressed it may be difficult to obtain a satisfactory clearance test following remediation work. If leaks or moisture remain or recur there is high risk of a problem. Demolition: remove wet, moldy, or water-damaged materials such as floor trim and moldy plaster/drywall where your investigation has found it in the building. Additional removal of stained, soiled, or moldy material beyond that cited in this section should be continued where opened/removed material discovers additional moldy or suspect materials. Remove building insulation wherever it is exposed by demolition. Remove insulation within 5 ft. Since future repair, demolition or cleaning processes can disclose hidden problems, anyone performing these tasks should, as a matter of general practice, be alert for discovery of leaks, water entry, building damage, mold reservoirs etc. Clean black-stained areas on ceiling and wall drywall using a non-phosphate commercial interior cleaner, after protecting floor surfaces and after moving out or protecting and covering furnishings. Alternatively you can elect to paint black-stained areas using a stain-covering paint, in which case We recommend use of a lacquer primer sealer. Do not use a latex sealer as stains often bleed through water-based paints and even some oil-based paints. Bin™, or Enamelac™ are trade names of two lacquer primer-sealer paints that work in this application. Proper ventilation and other procedures are necessary for health and safety during this procedure. Following cleaning and/or sealing in the stained areas, your painter can prime and paint the interior room walls and ceilings throughout. We recommend use of a vapor retarder primer paint on the inside surface of exterior walls and ceilings to reduce the moisture absorption into these materials in the future. Before stopping the demolition of damaged or moldy materials, be sure that all areas of known, visible, or most-suspect damage from leaks or moisture traps are opened and investigated. It is important that the extent of demolition continue sufficiently to see that no contaminated, moldy, insect-damaged, or rotted problem areas remain un-addressed. While there could certainly be other problem areas as yet undiscovered on the building, the following points of extra risk particularly suggested themselves based on observations made at the site or history which was reported for the building. These are areas of further investigation should indoor air quality complaints persist after the remediation measures recommended in this report have been completed. 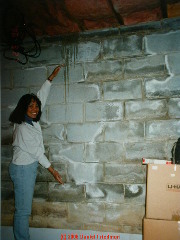 Our photo shows surface runoff or roof spillage that has entered a basement by running down the foundation wall. Unless this water source is corrected, the building will continue to suffer from excessive indoor humidity - a contributor to thermal tracking and soot staining. See the exterior and interior observations made during your building inspection, as these correlated with risk of water entry, moisture, mold, and allergens. Also see suggested items for repair or investigation under Exterior Recommendations, Interior Recommendation, Mechanical systems Recommendation beginning at 3.0 below. if leak damage is discovered by removing drywall in these spots, drywall should be removed to inspect lower areas such as at the floor and in the ceiling of any finished rooms below the floor in the same location. Leaks at floors – such as in a wet basement, where removal of material around the perimeter walls is necessary to be sure that all of the water entry points have been identified, diagnosed, and corrected. These are optional targets for further investigation: I did not find significant leakage evidence or other evidence in these spots sufficient to strongly recommend immediate destructive inspection of these areas, but it may be more economical to address any such findings as part of the current cleanup plan rather than later. Walls behind baseboards or other trim which have been left in place after flooding – if mold is found in these areas the wall cavities need to be opened for further exploration. I observed exterior conditions which are associated with leaks, high moisture, or other factors which contribute to mold/allergens in buildings. Please review your site exterior photos (in your site investigation report) as they provide additional specific details. These items have or may have contributed to water entry, interior mold in the building. Correct these sources of leaks and moisture to prevent future water entry to prevent mold re-growth. Maintain the gutters (loose, wrong slope, clogged, leaky), add drip edge or re-hang gutters if roof runoff runs behind gutters; extend downspouts at least 6ft. from the building and to locations that will drain away from the building; assure buried downspout lines are not clogged or leaking underground; correct improper in-slope grade which holds water against the foundation. Repair damaged, leaky exterior components and openings: doors, windows, chimneys, and roof penetrations. Besides items already cited above for cleaning or removal, I observed these interior conditions which are associated with mold/allergens in buildings. Please review your site interior photos attached to your thermal tracking and building inspection report as they provide specific details. Use mold-resistant construction materials and methods when repairing or restoring building areas which are to be demolished for cleaning or for other renovation and repairs. Please see these articles which offer details of these flood response and mold resistant construction methods. Complete missing attic insulation; remove/replace any insulation which appears dirty from rodent infestation. Wall to wall carpeting in the basement/below-grade level creates an ongoing risk of forming a mold reservoir. At the next event requiring cleaning or renovation, we recommend elimination of this material at this location, going to tile or vinyl flooring. Area rugs can still be used as these can be cleaned. – this is a condition I have been detecting frequently in buildings, even where the insulation looks clean to the eye. At the next event requiring demolition, cleaning, or renovation, we recommend elimination of use of ordinary fiberglass insulation in moisture-prone building cavities such as basement walls against below-grade foundation walls. Use solid foam insulation products which do not themselves absorb moisture and which are less mold friendly. Dry & Dehumidify wet/damp areas - seal foundation cracks; repair air-conditioning condensate leaks; repair plumbing leaks; install and use a dehumidifier in damp areas. Basement de-watering systems: if all of my outside recommendations have been completed correctly (and have been verified as complete and correct) and then water entry recurs it may be necessary to install an interior de-watering system. In general we do not recommend this approach as building dampness may still be excessive—it is more effective to prevent water entry from outside whenever possible. But sometimes outside measures are just impractical or more costly than an indoors basement or crawl space waterproofing project. Inside de-watering systems like B-Dri™ are a last resort. Basement waterproofing systems can be effective at keeping water off of the floors if they are properly installed. Improperly installed a basement de-watering system or basement waterproofing system and can create its own dampness problems in buildings. See Sump Pumps just below. Scented candles – can be a respiratory irritant to many people. We recommend abandoning use of and disposing of these items. Sump pumps - and other crawl-space or basement de-watering systems must be absolutely reliable. Even a single-event flood in a basement or crawl space is likely to lead to costly cleaning and renovations all over again. Crawl space venting – this is a debated topic as in humid weather venting outside air into a cool crawl space might increase crawl space moisture. Be sure that the dirt floor moisture barrier slopes to a drain. A great many installations we see, even in company product literature, show multiple low spots in a crawl space, each of which is subject to ponding and water retention from leaks or other unanticipated water entry into a crawl space or basement. Install a continuous dehumidification system (with a permanent drain hookup so the system can run unattended. Use an A/C condensate pump to a building drain if a gravity drain connection is not feasible. A dehumidifier in a crawl space will also provide some heat in that area; if the crawl space is too cold (despite perimeter insulation) it may be necessary to add a small level of heat there. Some building also permit introduction of dry heat into these areas. See our detailed article CRAWL SPACE DRYOUT - home for more complete information on how to dry out a wet or damp crawl space in order to reduce the chance of mold, insect damage, allergens, and structural rot. Central air conditioning: check the air handler(s) monthly (when the air filter is changed) to assure that the condensate handling system is not leaking into the building. If an attic system is missing a condensate overflow tray or missing a backup condensate overflow drain there is a risk of leaks into the ceiling if condensate leaks occur in the regular condensate piping. Duct work: check further for mold or accumulated dirt, debris, dust, allergens; have professionally cleaned if the duct material can be cleaned. Light dust and debris in ducts is normal and does not normally justify professional cleaning. If fiberglass board or flex-duct was used, flooded, contaminated (see lab report), visibly moldy or badly soiled duct sections will need to be replaced as these components can’t be cleaned and in my opinion encapsulants are unreliable. If non-cleanable replacement duct materials (fiberglass and flex duct) are installed they may need to be replaced again in the future. This may be cost-reasonable for accessible sections of flex duct but not for duct work run through building cavities or for major trunk lines. Watch out for incomplete-cleaning of duct-work; I often find mold growing where condensate collected in duct work is run through un-conditioned space such as a cool crawl space or hot attic. Window and wall-mounted air conditioners: clean these units and replace or clean washable filters monthly during the in-use season. If mold appears inside the air path of these units they are probably not cleanable and will need to be replaced. Plumbing: Replace any corroded/leaky traps and where demolition exposes tub or shower traps assure those are sound before completing repairs. Watch for and repair any future plumbing leaks promptly. Refrigerator: clean (using a HEPA vacuum) coils and grille as well as dust below and at other sides of the refrigerator. When cleaning the coil check that the evaporator tray is clean and that it is not spilling over. This is a common source of indoor mold and potentially Legionnaire’s disease. 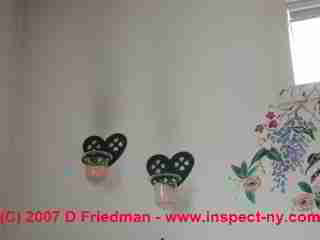 Mold on drywall can not normally be cleaned sufficiently as portions of the mold growth are inside the gypsum and paper. Except in the case of trivial soil or mold on a painted drywall surface, replacement is the effective means of remediation for this material. Material removal is more reliable than simple surface disinfection, but steps must be taken to avoid contaminating the building with construction dust and mold spores. Check/remove baseboard trim at floors: where floors or wall cavities have been flooded I often find mold growth on the back of baseboard or door trim, and on either or both sides of drywall or plaster where trim was installed; don’t assume that there is no mold in a wall cavity or that there is no mold behind wood trim just because no mold is visible on the wall surface. Avoid mold growth: Reduce or eliminate the conditions that encourage mold and fungal growth. In any building where there is recurrent water entry, there is risk of the conditions which produce or amplify mold growth. Depending on species, mold spores may die or become dormant, failing to reproduce, at low moisture levels. If the building is sufficiently damp or wet again, mold growth will probably recur. Always identify and correct obvious outside sources of water entry before going to the expense of costly basement waterproofing systems, though in some cases such systems may be necessary. Install a high-capacity dehumidifier and run it until basement moisture is in the 45-55% range. You may want to purchase an inexpensive relative-humidity indicator for this purpose. (See Radio Shack products.) You can drain the dehumidifier by a condensate pump or to a sump pit so it can run unattended (except for periodic cleaning). Missing backup condensate drain – can be compensated-for by installing a leak detection system in the condensate tray. This design will shut down the A/C system if a leak is detected, preventing water damage to the building from this source. Reader Question: Is there a professional whom we can contact for help in curing thermal tracking stains? First of all, I want to say thank you! Your site is the ONLY site that I was able to find the answer to what is wrong with my house. I now know that I have Thermal Tracking. My question to you is: Is there a professional that I can contact to take care of this problem? Drafts that move extra air across some surfaces can also be a factor in thermal tracking stain location. Simple cleaning and painting will of course remove or cover the stains from thermal tracking. But unless the cause of these stains is corrected as well, they will return. The optimum "fix" for these indoor stains on walls and ceilings and even sometimes on floors or carpets near walls is to improve building insulation, but of course that's the most costly step too, but then again, improving insulation returns savings in lower heating or cooling costs for the building as well as increased comfort. Short of improving insulation you can find and fix sources of excessive indoor moisture, stop using scented candles or other indoor burning things that produce soot, and improve housekeeping (better, HEPA-rated vacuum cleaner, for example) so that the level of house dust is reduced. And of course find and fix air leaks and drafts. An experienced home inspector or energy auditor should be able to help you track down and prioritize the locations and causes of the four thermal tracking stain factors I listed above. I have used primer to cover thermal tracking marks on wall studs and ceiling joists on interior walls only to have them reappear. What should I do to remedy the problem? Black marks, which follow studs and ceiling joist only on the sheetrocked exterior walls, continue to show through primed and painted walls. There have never been any improperly burning heaters, wood-burning stoves, non-vented heating appliances...used in the home. Interior walls are not affected. Colleen, the reappearance of stains through some paints is a common and annoying problem. Usually the root problem is that the stain is bleeding through a water soluble paint or on occasion even through an alkyd paint or primer. Try a lacquer primer sealer such as "Bin" or "Enamelac" or if those are not handy, spray the stains with a coating of spray shellac - clear or white if you prefer. When that's dry you should be able to paint over with your primer and not see the bleed-through. Thermal tracking marks will of course recur if we don't also address it root causes: indoor dust or debris levels, moisture, uneven or missing insulation. I have taken up all carpet and floor coverings to replace with hardwood, had all ductwork cleaned and will continue to monitor indoor moisture and dust levels. Hopefully this is the last time I have to prime all interior walls and ceilings before painting. Ceilings are equally as affected by the streaking/sooting effect. Do you know of any issue related to having two layers of vapor barrier inside walls contributing to this problem? The house was built in 1976 and is very well insulated, but side walls have foil-coated insulation batting between the studs and plastic on top of that, next to the sheetrock. One contractor suggested that may be contributing to the problem, saying a home should have one or the other but not both. The ceilings, however, have only plastic for a vapor barrier and are still equally as stained as the walls. It seems to make sense to me that the root cause would be related to dust/debris, moisture... that you suggested, versus an improper vapor barrier. Your thoughts? In a heating climate the vapor barrier goes on the warm side of the wall - the interior surface of the wall studs over which drywall is installed. In a cooling climate the vapor barrier goes on the warm side of the wall too but that becomes the exterior surface of the wall. Continue reading at INDOOR HOUSE DUST & DEBRIS or select a topic from closely-related articles below, or see our complete INDEX to RELATED ARTICLES below. Or see THERMAL TRACKING STAIN REMEDY FAQs - questions and answers posted originally on this page. THERMAL TRACKING REMEDIES at InspectApedia.com - online encyclopedia of building & environmental inspection, testing, diagnosis, repair, & problem prevention advice.